On the coast of Oregon, there is an undiscovered restaurant resting in the small town of Oceanside. Unless you happen to stop in the town of 300 people to catch the sunset on the beach, you would never know this little corner of heaven existed. With a view of the ocean that could make your heart sing and food to rival any prized restaurant, it's a true gem. A wooden beach house on main street has a small sign reading Roseanna's Cafe. With only a handful of businesses on main, Roseanna's is easy to spot—you can't miss it. The lightly faded curtains hanging in the windows invite you inside. The interior is small but friendly, holding no more than a dozen tables. The decor is dressed up as if you had just gone to visit your grandmother. It's familiar and quaint. There is an immediate sense of belonging—one or two meals at this place and you may want to start calling Roseanna's home. I know I did. At the end of July, a few friends and I rented a beach house on the coast of Oregon for a week. It was a beautiful visit, filled with the rise and fall of the tides and sand behind my ears. Near the end of our stay, we were craving a good, fresh seafood dinner. Willing to travel many miles for a feast, we wound up just a few minutes down the road. Roseanna's was the place to go, we were told. A quick glance at the menu is enough to make your mouth water. Simply reading through the descriptions will send your taste buds into a tailspin. Though I am not normally a seafood fan, I found myself getting excited about a real seafood dinner. With too many delicious options on the menu, my friends and I decided to share a little food here and there so everyone would get a taste. We started with seafood stuffed mushrooms and a loaf of bread I could swear was lighter than air. Though we tried to take our time and savor it, it was promptly inhaled with everyone fighting over the last few crumbs. It was a deliciously dirty sight when one of my friends nearly licked the plate clean for fear of wasting such a divine cream sauce. For my entree, I ordered the scallops drenched in a sun-dried tomato butter with a side of potatoes and string beans. After my first bite, I could have sworn I had died and gone to heaven. The flavors, the scallops, the butter... I immediately converted to a seafood lover. My first thought was of unspeakable emotion. The second was whether or not it would be strange to order an identical second entree. The third was to make everyone else have a bite because something this sinfully delicious couldn't be contained to one person or one stomach. And then, of course, came dessert. Though we had a few desserts sent to the table, the 3 milk coconut cake was deemed the table favorite and disappeared the quickest (we even begged the waitress for the secret to this heavenly cake). With the sun setting over the ocean and good friends around the table, it couldn't have been a happier moment. With that very moment in mind, I set out to recreate my own version of the 3 Milk Coconut Cake served at Roseanna's. The cake is essentially the base of tres leches cake, meaning a very light cake that can absorb a lot of liquid. A glaze of coconut milk, sweetened condensed milk, and coconut rum (who says you can't have a little fun?) is then poured over the cake. 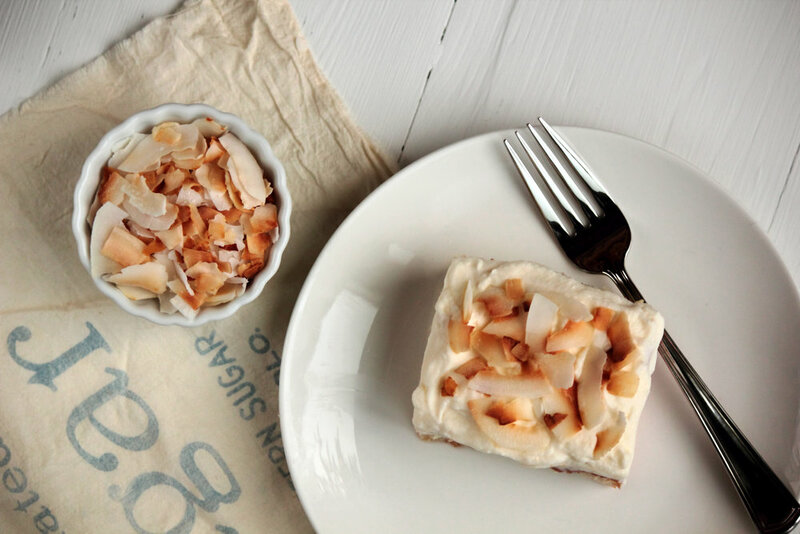 After soaking overnight, the cake is topped with a coconut rum infused whipped cream and toasted coconut. Man, oh man, this cake is good. Just ask my mother—she's eaten four pieces just today. For a kid friendly version, substitute heavy cream for the rum in the glaze and remove it completely from the topping (though, you don't have to share this one with the kids. It can be a special treat just for you. Just saying). Preheat oven to 350 degrees F (175 degrees C). Grease a 9 x 13-inch cake pan. In a large bowl, beat the egg yolks with 3/4 cup sugar until the yolks are a pale yellow. Stir in the milk and vanilla. Fold in the flour, baking powder, and salt until just combined. In a separate bowl, beat the egg whites until soft peaks form. Add the remaining 1/4 cup sugar and continue beating until stiff peaks form. Gently fold the egg whites into the cake batter, mixing until just combined (over-beating will result in a denser, flatter cake—not what we want!). Pour batter into prepared pan and bake for 30-35 minutes, or until cake is lightly browned and a toothpick inserted into the center comes out clean. Cool in pan until cake reaches room temperature. Pierce top of cake with a fork a couple dozen times to allow glaze to soak into the cake. In a medium bowl, whisk together coconut milk, sweetened condensed milk, and coconut rum. Pour evenly over cooled, hole-ridden cake, making sure to get the edges and corners as well as the center. Now here's the hard part: refrigerate the cake overnight so the cake can fully absorb the glaze. In a large bowl, beat the heavy whipping cream, sugar, and coconut rum together until topping is thick and spreadable. Spread topping evenly over coconut cake, sprinkle with toasted coconut flakes, and refrigerate until ready to serve.